Does your church have a website to keep your community involved, informed and engaged? Great. Is it working? Well, Google Analytics can tell you. Are the right people visiting my website? Data can tell you whether your site is reaching the right communities. Do you know if your website visitors are even in your state? Are potential congregants finding the “wrong” church? If I searched for Immanuel Church, will I get the website of the one in Jaffa, Israel or Attleboro, Massachusetts? If your site traffic is not local, then that’s a problem. Luckily, it’s fixable, but you should first know if the problem exists and that’s where Google Analytics comes in. In Google Analytics, click on Audience > Geo > Location. It starts at the country level but you can simply click on your country and then select region, city or metro area from the options just above the table. This data can tell you whether your site is reaching the right communities. If not, it’s time to tell Google that you’re relevant for your right location. The easiest way to ensure this is to add your church details to Google My Business. Language matters, too. Right above Location, in Google Analytics, you’ll see Language. This refers to the default language that your site visitors have their browser set to. The implications are obvious—if you’re getting a significant number of Spanish speakers, you might want to make sure that it’s clear you have a Spanish service on Sundays, or you might even want to offer some website content in Spanish. You’ll help Google know you’re relevant to Spanish speakers searching for church services in your area. Do new visitors feel welcome online? New website visitors are potentially new community members. How many people visiting your website are new—to your site and your church? New website visitors are potentially new community members. I recommend doing all you can, online, to welcome them and it might start with a special page on your website where you detail church activities and services specially for those first-timers. The key thing here is to get their email address or contact info so you can send them a newsletter or even personally invite them to an upcoming event. Include a sign-up form or a pop up. Be a little blatant! How does this tie into Google Analytics? Well, Google Analytics can tell you how many new visitors end up giving you their info. By setting up goals in Google Analytics, you’ll be able to track the percentage of new visitors who ask to hear from you. Then you can work to improve that number, or to attract more new visitors knowing you’re set up to make them welcome. Having a clear representation of your new visitors engagement allows you to have a point upon which to improve. The beautiful thing is that these improvements mean a bigger, happier community. Facebook likes and Twitter faves are often a false indication of engagement. I’m not here to judge anyone’s social media efforts. But many churches are very active on social media just because. If you enjoy engaging with your community on Facebook or Twitter, then and don’t worry about this section. However, if you want to get your social media community to sign up for events or take certain actions, then Google Analytics can tell you if your hard work is bearing fruit. If you’d like your Facebook community to visit your website and read your new content or sign up for an event, and you spent four hours last week posting status updates. 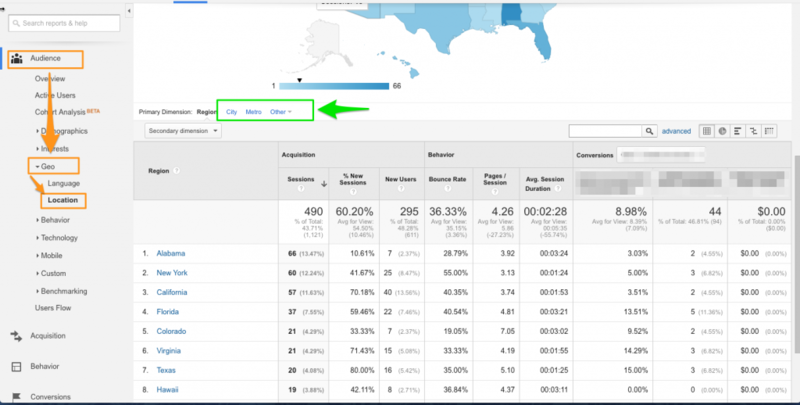 Now, Google Analytics can tell you if it worked. Google Analytics can give you a better sense as to whether you’re moving beyond social sites to your website and then the actions you’d like people to take. In Google Analytics, take a look at Acquisition > All Traffic > Channels. Here you’ll see where the number of visitors from Social Media (and other channels) and you can make an informed decision as to whether your time spent tweeting is worth it. Use bounce rate and exit rate to help you understand if those pages are serving your visitors. Are your website visitors interested in community news? Or do they visit the pages of your site with the calendar of events? You’ll learn what your visitors want to glean from your website. You’ll also learn where you should invest your energy so you can be sure you’re keeping your most visited pages up to date. It isn’t only page views that makes content “good” and popular, but let’s start there. In Google Analytics, you’ll find this info under Behavior > Site Content > All Pages. You’ll see each page of your site listed in descending order or the number of visits. Bounce rate usually implies that people didn’t find what they were looking for and, well, popped off to look somewhere else. Exit rate, on the other hand generally implies that the visitor found exactly what they wanted. Basically, Exit rate, good. Bounce rate bad. This isn’t always true though. If someone begins their visit on the home page and finds everything they were looking for, and then went away, Google Analytics still counts this as a bounce even though the visitor’s experience was quite positive. Please take this metric with a grain of salt, and rather watch for weirdly high bounce rates relative to your normal rates. So, when analyzing your top content, look at your most popular content but use bounce rate and exit rate to help you understand if those pages are serving your visitors. Looking at the data can be overwhelming, confusing and make you want to nap. Google Analytics can tell you so much more, and I could go on and on. To spare you an analytics-induced headache, I’ll stop here but mention one last point to consider before I go. Looking at the data can be overwhelming, confusing and make you want to nap. The trick is to start with a question you’d like answered, and then find that answer in Google Analytics. Do that, and you’ll find your data enlightening! Dean Levitt is the founder of Teacup Analytics. Dean realized that analyzing Google Analytics data could be way simpler so he created Teacup to help everyone easily understand their online audience and site performance. Read more posts by Dean Levitt | Want to write for us? Dean, this is great information for those who want their website to produce results for them instead of just being another item on their “checklist”. Great post with solid data. Thank you!